(Nanowerk News) Nanopositioning specialist PI (Physik Instrumente) L.P., a leader and solution provider in motion control and positioning components and systems, introduces the new PIglide HS planar XY air bearing stage, designed specifically to maximize throughput while providing the ultimate level of precision. This stage is ideal for wafer inspection and scribing applications, as well as other ultra-precision motion applications, such as flat panel inspection. 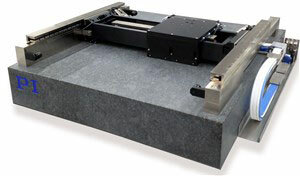 Why Use Planar Air Bearings in Precision Positioning Equipment? Air bearing positioners float on air to provide completely frictionless motion, resulting in negligible hysteresis or reversal error, excellent velocity stability, and zero-wear of mechanical components. Due to the surface averaging effect, straightness and flatness are significantly better than with conventional mechanical bearings. Planar stages further improve the performance because all motion on the XY axes is defined by the precisely ground granite surface. Unlike stacks of individual single-axis stages, with a planar stage, no bending moments are introduced when the load on the Y stage moves off-center. The PIglide HS uses magnetically preloaded air-bearings on the Y axes, and a vacuum preloaded X-Y puck that floats on the reference surface. The cross-beam mounts to the Y axis via a highly engineered flexural coupling that provides yaw-compliance without sacrificing system stiffness. The gantry axis is a dual air-bearing H-bridge design that incorporates dual linear motors and dual linear encoders. This improves turnaround performance while providing the added benefit of orthogonality/yaw/straightness control. Ironless linear motors provide smooth motion and no cogging or attractive forces. Both incremental and absolute encoder options are available. The PIglide HS incorporates three high-accuracy linear encoders, one for the bridge axis and two for the gantry axis. Each encoder is mounted so that the scale centerline is as close to the working plane as possible to reduce Abbe errors. The PIglide HS is coupled with industry-leading digital controls that offer superior servo update rates (up to 5 kHz), advanced control algorithms to improve dynamic performance and error compensation, and a wide suite of software development tools. Metrology, wafer inspection and scribing applications, ultra-precision motion applications, such as flat panel inspection.